Arrowpak has been in the moving, storage and distribution service for more than 33 years specialising in all forms of the industry and being a leader in the movement of United States Air Force Europe personnel.Arrowpak carries out over 10,000 moves every year from it's bespoke facilities in both England and Spain. We currently hold certified accreditations for Training and Insurance compliance within the industry and are members of all the leading bodies. With over 250,000 square feet of dedicated storage and warehousing we can offer the domestic mover and the corporate family the dedicated service they require. 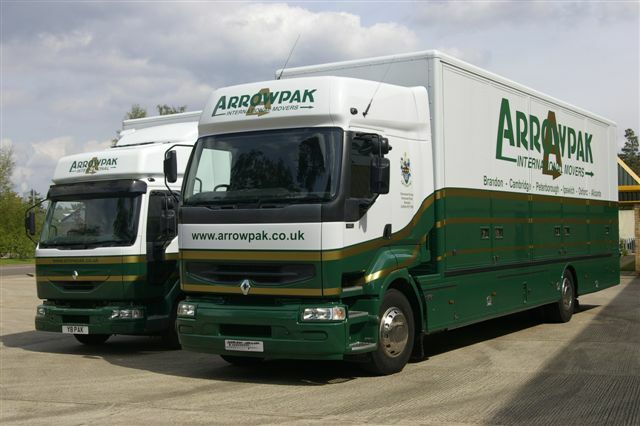 Arrowpak International for over 10 years has had its own import/export car facilities transporting over 3500 cars a year on dedicated transporters to and from abroad and our own distribution centre for new product furniture deliveries to warehousing and home. With corporate moving for the major companies around the world locating there executives, we also are specialists for government department of defense and embassy movements. A family run and owned business where moving around the corner or around the world is just a telephone call away. Click here to visit the Arrowpak web site.